Many of the Uno Attack card meanings are the same as they are for the classic game, UNO. However, there are some slight variations between the two games. The most obvious difference is that UNO Attack! incorporates a card launcher into the game play, making the game more fast-paced and unpredictable. 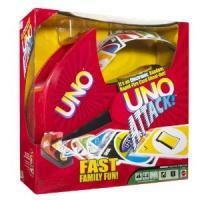 Since Uno Attack incorporates the card launcher, a few of the cards, such as the "Wild Hit Fire" and "Wild All Hit," make game play more exciting by utilizing the launcher during game play. By hitting the launcher, players can get one card or several. You can play a reverse card to change the direction of play. Reverse is a good card to play if you suspect the person who has just played, has nothing more to play. Reversing the direction of the game will immediately bring the play back to the player who just played, and if that player has nothing left, he will be forced to draw cards until he has something to play. Playing a skip card means that the next player to have a turn must be skipped. Skip cards are especially advantageous if the person that would be skipped is almost ready to call out, "Uno." Skipping that player will then prevent him from going out before you are able to. If you play a Hit 2 card, the player whose turn is next has to hit the launcher twice and does not get an opportunity to lay any cards down. It is never bad strategy to saddle an opponent with more cards, but this is another great card to save for when the player next to you has only a few cards left. Forcing him to draw another two cards will prolong his game, allowing you time to lose cards. If you lay down the "trade hands" card, you must trade hands with the player on your left. This is only advantageous if the player on your left has fewer cards than you have. If possible, the card is best played towards the end of a game when you are trading for a hand that has only one or two cards left. Playing the "Discard All" card allows you to discard all of the cards of a certain color from your hand. For example, if you play a red "Discard All" card, you can let go of all the red cards in your hand. This is a great strategy to employ mid-game, and particularly if you have a lot of one particular color. Just like in UNO, the wild card can be played on top of any color, and the player who lays it down calls out any color to continue play. Play this card when you need to change the color to something more advantageous in your own hand. Alternatively, you can save this card until the end to be almost guaranteed of going out. When a player puts down a "Wild Hit Fire," he calls a new color, and the person next to him hits the launcher until it shoots cards and adds those cards to his hand and forfeits his turn. The "Wild Hit Fire" card is best used when the player next to you has a small hand or when you need to change the color of the game. "Wild Hit Fire" cards force each person in the group (except for the person who played the card) to push the launcher button. The players then must add any cards to their hands that shoot out from the launcher. Play continues for each player, so it is okay if the launcher shoots cards multiple times. The player who played the Wild Hit Fire card, calls the next color. Ideally, you play this card when several people around the table have small hands for maximum impact. You can also play this card if you need to change the color of the cards being played. What makes UNO Attack! so addictive is the fact that you do not know when the launcher is going to shoot cards. This added element to game play makes the strategy more unpredictable. 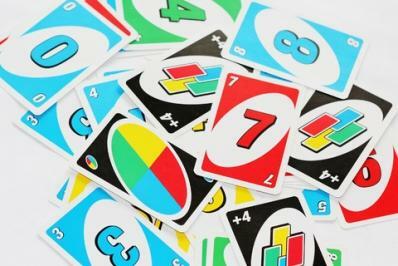 However, learning the Uno Attack card meanings, and utilizing them effectively, will help increase your chances of winning despite the unpredictable nature of the game.